In my family we have a tradition of eating pumpkin ice-cream with hot fudge sauce. Not necessarily an intuitive pairing, but it's incredibly tasty nonetheless. This means that I try to add chocolate to any pumpkin recipe I can, with the possible exception of pumpkin pie because you just can't mess with tradition too much without being in danger of being stabbed to death with salad forks by angry traditionalists. If you don't like pumpkin and chocolate then I suppose (she conceded grudgingly) you could leave out the chocolate chips. Stir dry ingredients into pumpkin mixture until just blended. Add in several handfuls of chocolate chips because everything is better with chocolate chips. Spoon into medium-sized muffin tin (should come out to exactly 12 muffins if you haven't eaten too much batter). Bake at 350 for 20-25 minutes (my oven tends to run hot, test muffins by sticking something into the center. With the exception of melted chocolate chips it should come out clean if they're done). I use a sharp knife but I understand that non-grad students use a "cake tester," whatever the hell that is. Eat tasty muffins. 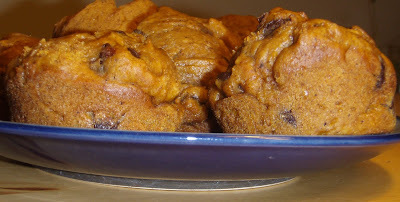 Sam, have I ever had the chance to make you my signature pumpkin chocolate chip muffins? While not as healthy-sounding as yours, I feel they truly capture the essence of why spiced pumpkin and dark chocolate belong together. I shall have to try your recipe sometime, though, just to see how it goes, because you can never have too many chocolate-pumpkin recipes! I don't think I've had yours, although I know you had my pumpkin-chocolate chip bundt cake back when we both lived in Utah. I like to think of these as a natural progression from that cake. Adam and I were vaguely thinking about having a cooking-oriented get together if he and I both go home for Christmas this year; I assume you'd be up for that?